Which came first – the chicken or the egg? People have argued convincingly on both sides of this age-old paradox and never reached a consensus. Well, if Joe Pulizzi, the founder of Content Marketing World is right, content marketers seem to be facing a similar quandary these days: Which comes first – the content or the audience, i.e., the consumer of the content? The inference seems to be that a business enterprise, which has previously built an audience by selling an earlier product and/or service, should now focus on expanding that audience through content marketing before selling anything new. This seemed a little like putting the cart (expanded audience) before the horse (new product and/or service) to us at The Marketing Id. Mr. Pulizzi went on to back up his declaration with examples of George Lucas of Star Wars fame (probably as his B2C example) and Arrow Electronics, which acquired EE Times, as his B2B model. It is pertinent to point out that Mr. Lucas first created his awesome Stars Wars content, which then generated a tremendous worldwide audience. Also, the EE Times kept creating compelling content that accrued an audience. Arrow Electronics simply acquired this audience that EE Times’ content had painstakingly accumulated over the years. The point being only few large businesses are really capable of “building an audience” through the acquisition of content producers, who had previously nurtured that audience. For most of the remaining large, medium and small B2Bs and B2Cs, they simply have to develop their own content first. If that content is desirable, the audiences will follow. Content marketers are often confronted with a “Field of Dreams” scenario, “If you build it, they will come.” In this reference, it’s the remarkable content or thought leadership that needs to be “built” first, because an audience will always consume content that is pertinent to its needs. In fact, The Marketing Id had made this very connection between content and content marketing in its July 2014 blog post, “Hey B2Bs, If Content is King, Content Marketing is Your Ace!” So let’s not put the cart (the audience) before the horse (content) for all marketers just because a few well-known brands have an audience already at their command. Besides, Mr. Pulizzi must know that Star Wars is a unique phenomenon that is not easily replicated. For example, even Johnny Depp’s long-standing “Pirates of the Caribbean” audience could not entirely fathom his role in “The Lone Ranger.” So even if Mr. Depp’s producers were seeking to expand his audience prior to the release of “The Lone Ranger,” box office numbers suggest that his audience may have actually shrunk after its release. 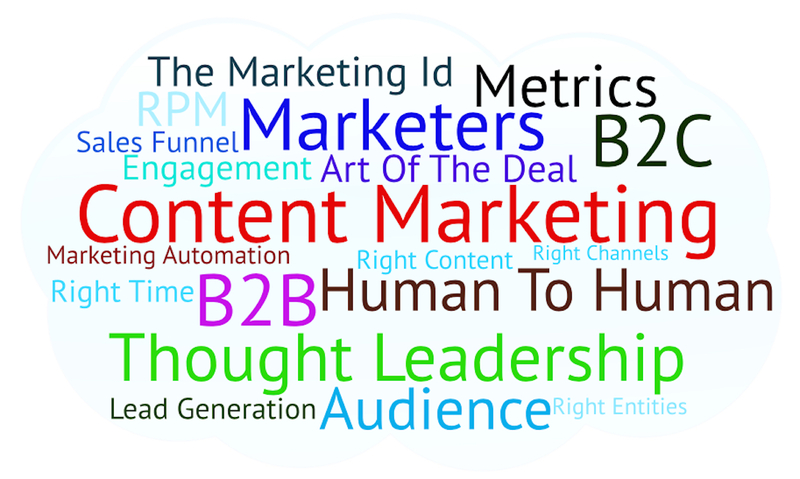 Mr. Callahan summarized this takeaway succinctly as, “It’s not B2B; it’s human to human,” which was most likely a reference from Bryan Kramer’s 2015 book, “There is No B2B or B2C: It’s Human to Human #H2H.” Yes, indeed, content marketing should also be about more human-to-human contact, especially in the B2B domain. In fact, in the B2B space, as is taken for granted in the B2C space, the concept about buyer personas is largely about identifying representative “human” personas to sell directly to at a targeted Business. However, the key selling attribute is that the seller side of the B2B needs to be a “human” as well – not a company just trying to peddle its wares. The Marketing Id has long promoted a simple encapsulation of content marketing as “Marketing the Right Content to the Right Entities at the Right Time using the Right Channels.” But it’s important for the content marketer, in both B2B and B2C domains, to make content marketing feel as human to human as possible! This does not imply personalizing every piece of content; it simply means that throughout the customer life cycle, content marketers should remember to insert a human interface, especially into their marketing automation campaigns, as necessary. During the MQL (Marketing Qualified Lead) phase, it could be someone from the marketing team and during the SQL (Sales Qualified Lead) phase, this already happens with the sales rep that owns the lead. Well, content marketers need to turn that sentiment upside down by making it personal in their B2B marketing efforts because, if they don’t, that lead is not going to progress rapidly through the funnel towards a deal. And, to borrow a phrase from Donald Trump, “the art of the deal” is also about making it personal on the content marketing side!